Take a Customer to Lunch! Loyalty programs work with consumers. Airlines, hotels, rental car companies, Hallmark, Famous Footwear, and Safeway, among others, have proved that people will respond to rewards. Consumers want to accumulate points or miles. They love it. Most marketers have assumed that such programs would not work as well for business to business. They are wrong. This is a story about NYNEX, the former northern east region of Bell Atlantic, and what William McAndrews, Business Product Development manager, was able to do to create a successful loyalty program for business telephone customers. In 1995, telephone companies were notified that in 1996, competitors could come in to threaten their toll calling business. For NYNEX, this represented a large and lucrative portion of the $7 billion dollar business in their New York market. Until that time, they had substantially all of it to themselves. NYNEX wanted to protect their market from intruders. The idea was to build a relationship with their existing customers to innoculate them from the blandishments of outsiders like AT&T, MCI, and other competitors. At that time NYNEX did not have a customer marketing database. What they had was simply the legacy billing database on their internal mainframe. Time was short. It was obvious to McAndrews that IT could not create a marketing database suitable for a loyalty program in a few months. He found an outside firm that was not only willing to partner in the development of the fulfillment system for business customers but was capable of building their first loyalty database. It had to be done fast and had to be very cost effective. Many business customers had multiple accounts. IT could not consolidate them into one bill so that you could see who your most valuable customers were from a marketing standpoint. The outside vendor was able to do that. They built not only the database, but the loyalty bonus point fulfillment system in six months. Then, as now, the market was changing. Business customers were becoming more demanding. Some knew more about the telecommunications market than the telephone company did. Most of the business customers were loyal to NYNEX and were prepared to stick with them, but they wanted to be recognized and rewarded for their business. They wanted a personal relationship with the company. They wanted to hear their name. Even though NYNEX had $7 billion in revenue, management did not provide much money for relationship marketing. So McAndrews had to build his system on a shoe string. He was allowed only five people to work on this lucrative market. He was told that he had to prove that his new loyalty program fit the corporate strategy. One part of the strategy said, “Maintain this market. Don’t lose market share.” He took those two sentences and ran with them. McAndrews wanted to build a relationship with customers. He wanted customers to want to call up their phone company and talk about their service needs. But the mentality of Customer Service in NYNEX at that time was just the opposite. Talking on the phone to customers costs money. Try to avoid having people call, and when they do, get them off the phone fast. It was an uphill battle to get relationship building across in the company. For volume rewards, what emerged was a system called deferred credit. For every dollar that business customers spent, they would receive a bonus credit which could be used to pay for additional services, or gain other rewards and benefits. It was the creation of a new currency similar to airline miles. The deferred credits were shown on the customer’s monthly statements, as a part of a special quarterly relationship statement, and on the company’s the financial statement. The credits belonged to the customers. But, if the customer defected, they could be given away as bonuses to other customers. The new system had to be relevant to a business user. It had to make sense. It had to be convenient – no collecting of coupons or chits. It had to be easy. It had to have perceived value, so that the customers could build up equity in NYNEX which they would lose if they defected. The bonus credits were worth, for example, about $0.02 to NYNEX, but they appeared to the customer to be worth much more. Each additional service that McAndrews was able to sell to a business customer enhanced the relationship, and reduced the probability of defection. The bonus points, thus had a double benefit for NYNEX: increased retention due to the credits and due to the additional services. Sales of these additional services went up by 15% due to the program. McAndrews developed 126 different versions of a targeted newsletter to business customers. In addition, bonus credits were given out as rewards to customers for various purposes such as responding to a survey, or adding additional services. Looking for additional uses for the bonus credits, McAndrews and his team hit on the idea of “Take a customer to lunch”. In the Westchester area, they targeted fifteen white table restaurants who were willing to buy in on the program. Customers requested customer luncheon certificates which they could give to the restaurants in exchange for meals. 18% of the targeted business customers participated in this program. The restaurants loved it, because it brought in many business customers who might not otherwise have visited their establishments. The restaurants used the certificates earned to pay for their own telephone service. Everybody won, especially NYNEX. So what was the result of the program? Before this program was launched, industry analysts estimated that NYNEX might lose 40 to 50% of their business customer calling revenue in the coming year. Many other regional bells did just that. NYNEX, on the other hand, lost only about 15%. The program was such a success, that Bell Atlantic developed plans to roll it out to the Mid-Atlantic states. 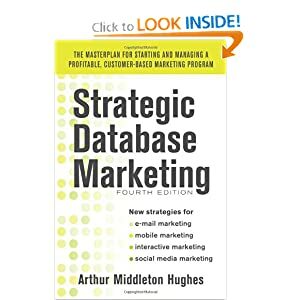 Clearly, what Bill McAndrews was able to do represents a tremendous illustration of the success of database marketing. Everyone agrees with the theory of relationship building, but how many companies are actually successful at it? The NYNEX experiment is one outstanding example of how to do it.